Description Of Item: From the Harry Potter movie: The Order of the Phoenix. With a single push of a button, you can hear Harry Potter enchanting you with a spell, or a quote from a movie. 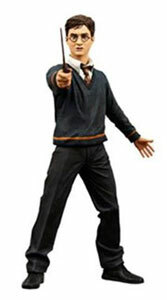 This highly detailed Harry Potter action figure features Harry in his school uniform. The poseable figure includes ball jointed neck, torso and left shoulder and more articulation. The figure comes complete with movie accurate wand and speaks movie phrases.